I love gifts that are projects-to-be! All I needed to do was (a) paint it…because why not?, and (b) add some wooden dowels in the gun slots for hanging the scrap fabric. It would be wonderful fabric storage or fabric organization for my craft room / sewing room. Ready for repurposing with the help of dowels! The painting part went swimmingly. But when I laid the dowels in the slots to figure out how much to trim off, I was reminded that this rack was mean to hold shotguns, and everything was askew. The slot meant for the stock was deeper/lower than the slot used for the barrel. Whoops! I guesstimated that there was a one-inch deficit on the left side…and my dowels were one-inch in diameter. The slots were about ⅜” wide, so we sliced off little dowel “coins” with our newest power tool! I had to trim the wooden dowels for my fabric organizer anyway, so why not use the scraps as risers to even out the wall gun rack / rifle rack? After sanding down the edges of my risers, I painted them to match the wall gun rack, and used wood glue to attach them inside the lower slots. I used rubber bands to hold the risers in place as the wood glue dried and set. They worked perfectly in this capacity! I had originally planned to paint the wooden dowel white, but after painting the risers, I discovered just how porous and thirsty dowels are. Instead of dealing with a potentially botched paint job, I changed up the plan and used Mod Podge to decoupage fabric (courtesy of a vintage bed sheet) to give them some flair. Making the dowel racks pretty! When all was said and done (i.e., dry), I set everything up- and my fabric organizer looked great! 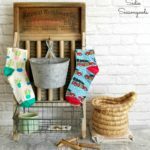 The fabric decoupaged wooden dowels really popped against the painted wall gun rack. This was going to look FABULOUS in my craft room / sewing room! My, my, my- don’t you look pretty! To increase my fabric storage, I added large white cup hooks to the ends of each wooden dowel so that I could hang additional scrap fabric from them. Additionally, I slid some curtain ring clips on the bottom dowel in my wall gun rack, too. Even more fabric storage for my fabric organizer! And more organization opportunity here! And then I simply added all of my smaller pieces of scrap fabric – draped over dowels, clipped to the rings, and hanging on the hooks! All done and SO fabulous! Reducing my fabric storage in large cumbersome bins is a real space saver in a smaller craft room or sewing room, isn’t it? 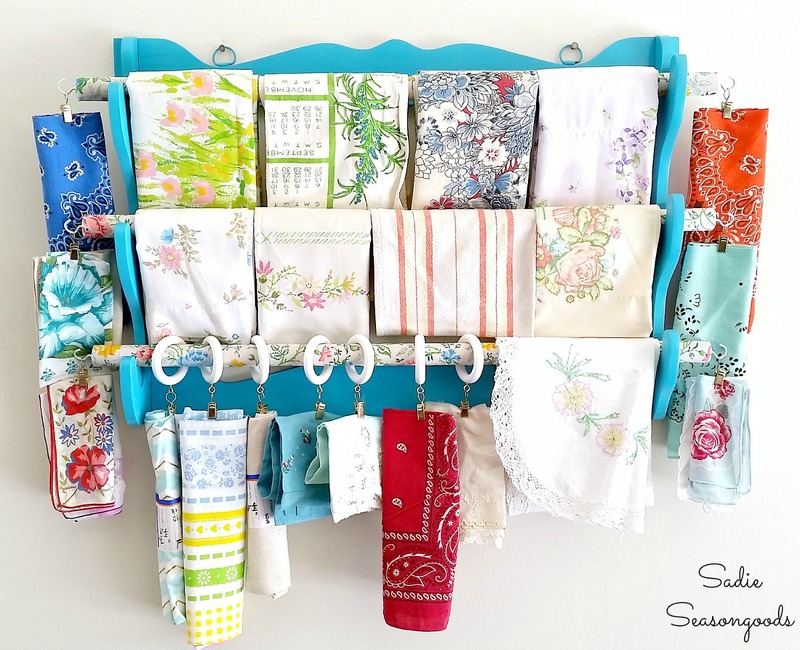 A wall gun rack upcycled into a fabric organizer for scrap fabric is a great use of wall space for organization! Not only is my gun rack fabric organizer handy, but it looks gorgeous- AND it’ll remind me which fabrics I have when I’m brainstorming projects. A triple whammy repurpose! Want even more upcycled organization inspiration? Please check out my entire collection of repurposed storage project ideas here before you go! Sarah, I love it. Your capacity to create has no limit! You’re so gifted! I love the way you covered the dowels! Clever trick to make the one side higher, too. Great job!!! What a creative imagination you have! This will look great with vinage tea tools as well! Gonna be on the lookout for gunracks now! Thank you! It really is gorgeous and a much better use for a fun rack. Lol!! I love it. Stunning for sure. Very creative. Love it. I really like the transformation. Maybe can be used in the bathroom to hang towels on. Stunning redo! Very clever to recover the thirsty dowels with fabric rather than painting. Loving, pinning, sharing, and stealing the idea for a store display! You better show it to me when we Ride the Ridge soon!! Wowza! What a transformation and SO darn clever. I have to laugh just thinking about what the original owner of that gun rack would be thinking if he/she could see it now. Thanks for sharing at Talk of the Town. What a great idea! 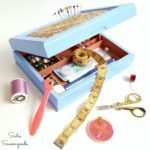 I love this.Keeps your fabric neat and organized and easy to see. Thanks for sharing! I love this lovely and bright colours and really useful. I saw one of these racks in my local auction house last week, I wish I’d bought it now, I’ll have to look out for another one. What a great ideal, I see these all the time at garage sales and thrift stores. Like everyone one has said the possibilities for its use are unlimited. Thanks, Sandy- and most definitely! I love it. The only thing that I don’t understand is the dowel coins. Why? What purpose do they serve? Look at the photo of the hanging gun rack with the plain wood dowels laying in the slots- see how uneven they are? They all slant down to the left. Gluing in those “dowel coins” raises the dowels so that they lay evenly in the slots. purpose a gun rack the way you did, then make it so pretty on top of it. Awesome. I can imagine you’ve given lots of crafters ideas for their stashes, me included. I have plastic boxes and iris carts full of fabric. Every time I need some for project have to go digging in drawers and boxes. my sewing room is smaller than most people have for walk in closet. You’ve sure inspired me. Well have to go have physical therapy.. Had shoulder parts replaced on 12/7 so now have to get arm and shoulder working as should be. Can do lots with arm in down ward tasks but lifting it up is not happening yet. You keep popping out those incredible repurposes, will look forward to seeing what you do next. Thank you so much- and good luck with PT! It is a long, sometimes painful process but SO incredibly worth it. This isn’t first time for pt for me, had both knees replaced in 08 and 09, but had better insurance then. Now I will have to pay $40 each time I go to pt. When company bought out Humana and other one they changed premium amounts, almost $30 higher than what I was paying but also bumped me down to less coverage program. They told AARP there would not be any increases in premiums but before year was over got letter informing me of higher premium. So they lied to Aarp. We got no COLA this year so too bad if we have to pay more for insurance besides the $104.90 taken out of our checks for Medicare. To say I’m pretty ticked off would be putting it very mildly. Think I need to let Aarp know how they lied to people about increases, how much and how I was bumped down to lesser program without being informed. Having to find out hard way. Sorry for the rant but what are we supposed to do? We had such hard time over recession with 5 weeks between paydays as it is for so many months. We did go to food bank few times but food given is far from what is healthy and nutritious and certainly not enuf to cover 4 weeks let alone 5 weeks. Is high fat, high sodium. In case people think seniors are floating in money, many of us are not. It was even said in our newspaper few weeks ago that Grand Junction, CO is one of highest for medical costs. It’s high for too many things, wouldn’t have moved here if we’d known at time, Real estate costs here are atrocious and ridiculous. Thank you for letting me state my case. Other older people should know about this situation so I will be informing Aarp about this. They had article in one of their publications shortly after company bought out Humana and other company. Are ceo’s having good time on seniors money? What a clever use for an old gun rack! I love your choice of colors and fabrics for the redo! Why not use it for spools of ribbob? Love the idea! Exactly, why not? If I hadn’t already made a ribbon holder for a blog post last year, I might have done that with this! Sorry! I’m new to your blog. This reminds of a vintage shop that displays their towels/hankies this way. So pretty! Although my hubby would probably steal the rack for his guns…lol. LOL…I think you’re not the only one who thinks that!! What a transformation!! My mom totally had those sheets you used on the dowels when I was growing up (and probably still does!) Thank you for sharing at Merry Monday! Great recycle project.Thanks for sharing with us at Throwback Thursday. Can’t wait to see what you bring this week! What a perfect idea~! It would make such a great quilt display, too! I love this project! You are so clever! I can’t tell you how many racks like that I have passed up in thrift stores – never again! Absolutely genius! I will probably never overlook an old gun rack again! I love the way you adapted to the shape of the rack to meet your needs. And, good tip about the porous dowel rods. You are truly the queen of re-purposing! Great idea here! I keep all my fabrics on pants hangers in a spare closet, but one of these would be great for hanging a few of our favorite afghans. They would be handy and displayed, too! Thanks so much for sharing over at Celebrate Your Story! This is such a great idea and it’s so colorful and feminine, you nailed this one! My fabric pieces are stuffed in a plastic bin that was too small 10 pieces of fabric ago. Thank you so much for sharing this at Celebrate Your Story and we hope you join us again. Thank you so much, Marci! Funny, there was one of these gun racks in my Grandmother’s house. The guns are gone so it was just hanging there on the wall. When I saw your post on Pinterest, I said, “So, that’s what it is!” 🙂 I got permission to have it and took it home. I don’t have fabric scraps so much as paper punches, so I’m going to use it for that. I was afraid a wooden dowel wouldn’t be strong enough for the heavy punches, so I got some PVC pipe. Looks like it will work, but I’m still putting together my craft room, so I haven’t put it to use yet. Just wanted to share the idea in case another reader was looking for a similar solution. So simple, yet so pretty! I love the blue color. And it has so many other potential uses as well. I feature organizing ideas on Fridays. Please share this great idea at Simple Organization Ideas on Organized 31! (You can find the link in the Navigation Bar). I am not talented enough to do this but I do so love it. Beautiful! There you go again!! That’s the prettiest gun rack ever! I love the way you decorated the rods. Using this for fabric storage is brilliant. I love your ingenuity. I thought the cloth covered dowels were to keep the cloth from slipping! That lower shelf would be good for ribbon rolls, too. I would love one to keep pieces of current projects (18″ doll clothes for the grands and mending) in sight! There’s another item to add to my “look for at yard sales list”! You always amaze and inspire! Thank you for sharing your talents and joy!! !